We lift together. We encourage each other. We are cultivating an atmosphere where every member is committed to each other's success. We help each other get better. The barbell lifts come first though our athletic-style of training includes powerlifting, Olympic weightlifting, sandbag movements, tire smashing, kettlebell lifting and more. These groups are for you if you want to achieve strength, health and athletic goals through hard work. Interested lifters, no matter how strong or fit you are, are welcome to contact Terminal City Training. The criteria for group training is a commitment to the other members with whom you train and suffer. *new*- Early morning training coming soon. Email us if you are interested times TBD based on demand. 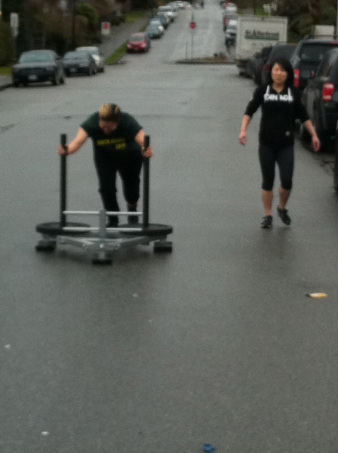 The Garage Gym is located near Powell Street and Victoria Drive in East Vancouver.